Stamping with Loll: Happy Birthday Darnell! I started by creating a Splash Watercolour background. Click HERE to see my tutorial on how to do this technique. This time I used regular Neenah 110 lb. card stock. I was surprised it worked so well. Always good to experiment. You can see all the splashes of yellow that create a lot of visual texture and depth. LOVE how it turned out. After drying with a heat tool, I placed a sun stencil over top and sponged on more of the same two shades of yellow ... first Squeezed Lemonade over the whole stencil, fading out towards the ends of the rays, and then Mustard Seed, concentrating more on the sun itself, and blending out into the rays. To finish, I stamped my sentiment in black, added three small die-cut clouds and a few sequins for sparkle. Fun card to make. If you have some time, make sure to pop over to Darnell's blog (djkardkreations) and wish her a Happy Birthday. Darnell is certainly a little ray of sunshine and this card is fabulous, love it. This is certainly an uplifting card...just like Darnell. I know she will love this beautiful card. This card is total WOW!! The yellows used in the splash bgrd. and with the stencil really make an impact. Plus the sentiment and the clouds bringing it all together. The design and the result rock (smiley face). This card is perfect for Darnell. She definitely brings sunshine to many. Your design is flawless. Darnell is sure to love it and you are so right. She is such a ray of sunshine and someone others reach out to with ease and comfort. I hope you have the best day posible if you read this Darnell but will come over and visit as well. yes, this card is perfect for Darnell, I love it. LOVE all this sunshine especially on this cloudy day! Darnell is like sunshine on any day! A wonderful stencil and card for a bright and loving friend! 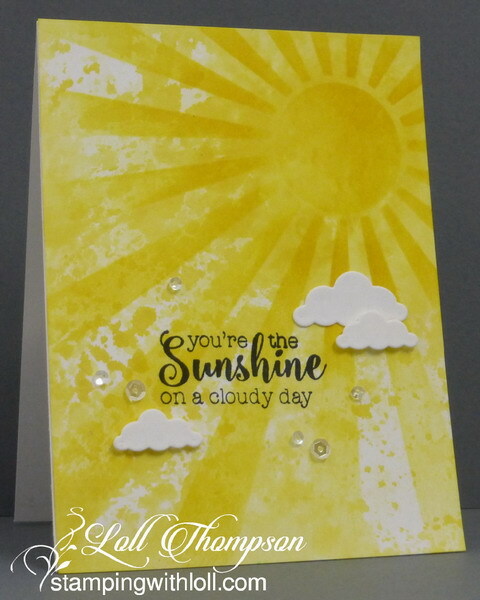 A beautiful, sunny card for a beautiful sunny person!! Well done, Loll. Beautiful card, Loll! It's perfect for Darnell. She is definitely always a ray of sunshine! Oh, PS, your card has been here for ages, but this year I saved every card to open this morning. It was fun!! And this card is even more glorious in real life!! MWAH! What a delightful, happy card, Loll! I'm sure she will smile when she gets this one! You do come up with some fabulous techniques and I enjoy seeing them! What a wonderful sunshiny card for the lovely Darnell who brightens any day, Loll!!! Your bg looks fabulous and the little clouds and sprinkle of sequins really let your card stand out as a masterpiece!!!! Wonderfully done!!! What a sunny and gorgeous card to brighten up our Darnell's special day! So adore the stencil you made yourself and the splattery technique! Wonderful ray of sunshine for Darnell! I love the way the clouds are tiny and the sun is so big - works perfectly with the sentiment! And great placement of the sequins! No kidding visual texture and depth! Amazing that it's actually monochromatic! The perfect theme and sentiment for Ms Sunshine. That's a whole lot of sunshine, Loll, and perfect for our lovely Darnell. The stencil over the background really does add a lot of dimension.